Can Sir Ken help Morrisons thrive nationwide? If you want to get ahead in business, don't be too proud to root through the odd dustbin. That is the message from today's takeover bid of supermarket giant Safeway, a deal which will catapult northern retailer Morrisons into the big league. Sir Ken Morrison, the 71-year-old son of the firm's founder, has worked his way to the top through a near-obsessive attention to detail. Going through supermarket bins (hunting, he says, for insights into how his stores are run) and opening packs of sandwiches at random (to check for freshness) could be dismissed as eccentric micro-management. But if micro-management earns a �1.3bn personal fortune, as it has done for Sir Ken, then eccentricity obviously has something going for it. On the face of things, Sir Ken is almost a caricature of the bluff Yorkshire businessman. In his few interviews - he is a man of few words - he pours scorn on fancy management theories that underpin much of modern retailing. 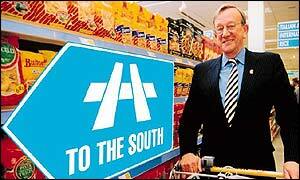 Running supermarkets is easy, he says. "It's just taking money off people. And giving them something in return." If he has anything as rarefied as a philosophy, it is to remain in close touch with his stores and his staff; he even lunches at a Morrisons store at least once a week. This results in a straightforward but highly effective focus on providing quality products at the keenest possible price to a closely targeted market - the penny-conscious lower-income consumers of the North of England. But Sir Ken plainly has a sophisticated touch. His peers reckon him the most accomplished grocer in Britain, as do the markets - at a time of mixed fortunes for retailers, Morrisons shares have doubled in value since 2000. That's partly the result of sound management, but also rewards the firm's policy of dealing openly with investors. Morrisons rejects most of the fancy ideas pressed on it by City bankers, and does not even retain a PR firm to handle its investor relations. So why did its shares fall 10% after it unveiled its latest coup? The answer may spring from the some of the virtues that made the firm strong in the first place. Exercising iron control of a small store network across a limited geographical area is easy enough; extend that network fivefold, and spread it across Britain, and such control becomes impossible. At best, Morrisons might be able to ape US-based Wal-Mart, the world's biggest retailer, which remains hugely driven by cost despite its immense global sprawl. But seasoned investors may miss the presence of Britain's best grocer going through the bins. Even if he could cope with five times as many bins, Sir Ken is not going to be around forever. The cloud in Morrisons' sky is the lack of a coherent succession policy. Sir Ken has groomed his son, a marketing executive in his late twenties, to take over - but investors may have other ideas. As Morrisons swallows Safeway's much larger network, with all its own peculiarities and traditions, it will not be able to remain a cosy family business for long. Two years ago, Sir Ken called Safeway an "indigestible meal". Shareholders had better hope that - for once - he was wrong. "It will create the third largest supermarket in the UK"
"Overall there will be a lot of job creation"